*PLEASE NOTE: These statements have not been evaluated by the Food and Drug Administration. This product is not intended to diagnose, treat, cure, or prevent any disease. How do you know what will really work for you and your PCOS? Is there an easy way to get pregnant fast or a proven method to follow for getting pregnant with PCOS? Is there a specific fertility supplement you can take that will help you get pregnant? Well, you’re in luck! We’ve done our research and have found some important, actionable information regarding fertility supplements and getting pregnant with PCOS. Getting pregnant, even for those that do not suffer from a PCOS diagnosis, can be a daunting, emotional and challenging feat. Especially, if you’ve been trying to get pregnant for any length of time without success. It doesn’t help that there are so many fertility supplements and claims in the market place. The entire category revolving around ways to get pregnant is vast and can be overwhelming, which is why we’ve broken down the basics regarding getting pregnant with PCOS to help you gain clarity and renew your hope that it IS possible. According to MedicineNet.com, Polcystic ovary syndrome is a condition in women characterized by irregular or no menstrual periods, acne, obesity, and excess hair growth. PCOS is a disorder of chronically abnormal ovarian function and hyperandrogenism (abnormally elevated androgen levels). It affects 5-10% of women of reproductive age. Infertility is defined as “not being able to get pregnant after one year of trying (or six months if a woman is 35 or older)." An estimated ? of infertility problems are caused by women’s issues and another ? of fertility problems are due to the man’s issues, with the last ? being a combination of both. The article goes on to explain that women who are diagnosed with the PCOS disorder and are trying to get pregnant, typically are prescribed clomiphene (Clomid), a drug with side effects that include headaches, vomiting, nausea as well as other possible birth defects for babies conceived shortly after or while using the drug. Who wants to have symptoms of morning sickness BEFORE they’re even pregnant?! Not us! When we started to look into fertility issues, we discovered there are several herbs available that when combined into the right formulation, they can help improve your chances of getting pregnant both for those with PCOS and those that are trying to get pregnant naturally. As the most common endocrinopathy in women, PCOS results from insulin resistance and the compensatory hyperinsulinemia. Of the many adverse effects that happen due to this hormonal imbalance, the main ones that affect your ability to get pregnant fast include anovulation, abnormal uterine bleeding and infertility. An egg is released from a woman’s ovaries. Ideally, this means having a consistent cycle. The egg goes through a fallopian tube toward the uterus. Women who suffer from PCOS, endometriosis, pelvic inflammatory disease and other ovarian issues may ovulate, but the egg can get stuck. The egg is then joined by a man’s sperm. Once fertilized, the egg must then attach to the inside of the uterus. Given that PCOS is a hormonal disorder that can cause cysts on the edge of each ovary, this diagnosis can explain the absence of menstruation, unexplained weight gain, excessive hair growth and acne. As many as 5 million women experience symptoms of PCOS and many of them experience self-esteem, appearance and mood issues due to the symptoms like increased facial hair, acne, pelvic pain and depression. However, there is hope that these hormonal levels can regain stability and the chances of getting pregnant can be improved as a result. PCOS is a very challenging endocrinological disorder in women and typically results in higher than normal levels of male hormones and insufficient levels of the essential female hormone, progesterone. This imbalance of hormone levels is what can have a ripple effect of problems in the system and result in many of the unpleasant symptoms already discussed as well as inhibit a woman’s ability to get pregnant. What Can You Do to Get Pregnant with PCOS? It may be obvious, but a healthy diet, having a consistent exercise routine and drinking lots of water are essential when trying to conceive and are even more important when facing hormonal struggles like PCOS. In addition to these lifestyle basics, there are also fertility supplements that can help you get pregnant with PCOS. In fact, there are many herbs on the market today that can contribute to improving the symptoms of PCOS*! There are three herbs in our UpSpring Fertility+ formula that have been specifically combined for their synergistic properties that aide in fertility. This Peruvian grown root serves as an adaptogenic herb that’s filled with powerful nutrients to heal weaknesses found in the body. Traditionally, maca root has been known for its energy-producing effect that helps to boost libido and reduce stress. (Both imperative things when trying to get pregnant!) Another important effect in this fertility supplement root is the fact that is contains 50+ phytochemicals that are known for balancing hormonal levels by acting on the hypothalamus-pituitary axis which may account for why its effects in humans are not limited to the ovaries or testes, but also the adrenal glands. A recent study done by Dr. Gloria Chacon has shown the organs that play large roles in fertility and menopause including the hypothalamus-pituitary axis, pancreas and thyroid, all benefit from the alkaloids found in maca root. In fact, according to Dr. Chacon, maca promotes optimal functioning of the hypothalamus, the pituitary and thereby the overall function of the endocrine glands (ie the body’s hormone distribution). The results of the study showed significant alleviation of symptoms of discomfort in the majority of women (74-87%) with the additional benefit of “reduction in body weight, blood pressure and increasing serum HDL and Iron, pre-gelatinized Maca-GO may be a valuable non-hormonal plant preparation for balancing levels of hormones and alleviating negative physiological and psychological symptoms." Unlike soy/genistein, maca contains no plant hormones (4) and has been attracting more and more attention from biochemical and therapeutic professions for its promising physiological regulation and stimulating action of the ovaries. Maca’s historical use as a fertility supplement by the natives of Peru is only one aspect of its many healing properties including regulating menstruation, lessening menopausal symptoms, and increasing energy and libido. The scientific research behind PCOS symptoms and how they’ve improved after using a Shatavari regimen is incredibly encouraging. The imbalance that PCOS has on the body typically means women experience having a are higher than normal level of male hormones while simultaneously experiencing insufficient levels of the essential female hormone, progesterone. According to this fertility supplement study, up to “85% of PCOS patients who were treated with shatavari regimen were able to get their symptoms under control, while 75% of the patients conceived.” The shatavari helps women with PCOS conceive by managing insulin levels which works as a messenger tell the body how many hormones to produce and thereby promotes balance. As with anything in life, including fertility supplements and finding ways to get pregnant with PCOS, it’s about discovering a proper balance. Our bodies are amazing and powerful, but sometimes they need a little help to rebalance and optimize. If you suffer from PCOS symptoms and are trying to get pregnant, know that you are not alone. With more than 5 million women suffering from PCOS symptoms, it’s no surprise why there’s a growing demand for natural fertility supplements and natural ways to get pregnant with PCOS. We hope that the information outlined above is helpful for you on your journey to getting pregnant and that the in-depth look at 3 powerful herbs shown to aid in fertility can help you find the right, natural fertility supplement for your body. Getting pregnant isn’t always as easy as you’d think. Luckily, our Fertility+ all natural supplement is here to help and available on Amazon, at Target and in the UpSpring store. Look for UpSpring Fertility+ capsules and our other great products at Target in the Women’s Health and Fertility Planning aisle. Click here to buy Fertility+ Online Now! 3 Moms Share Their Story on How they Got Pregnant Despite Infertility Challenges. Folic Acid or Folate? This critical nutrient can have a major impact on your baby's neural tube development. The one nutrient associated with improved baby brain health, does your prenatal have it? Ate the safe to use while breastfeeding, And if so then would they affect the milk or the milk production??? Can you take all three supplements at 1 time? We've been trying for 5 years now. I would love to get the pill.. but I live in Jamaica .. is there a way to get it here? I am wondering if any of the fertility supplements really work for someone with pcos? I don't want to buy something that's not going to help me. Hi Allisha! While no fertility supplement is a guarantee, the UpSpring Fertility+ has been specifically formulated to optimize your body for conception. The three main herbs work together to efficiently shed the uterine lining and normalize hormones to regulate your cycle and increase your chances of conceiving each month. Feel free to read the many reviews that say they got pregnant only after taking for a few months! Is this safe to take with Vitex? Hi Emily! I'm Kristi from UpSpring. In answer to your question about whether this is safe to take with Vitex, since every one's body chemistry and health history are different, we highly suggest you ask your doctor to be sure. Hi Moh! I work for UpSpring and our Fertility+ is a 30 day supply and comes with 30 capsules. You take one per day and you can start taking them at any time. Personally, I recommend taking them during or immediately after your period, but some women, especially those who suffer from PCOS, do not have periods and would benefit from taking them sooner than later. Sending you lots of love and baby vibes! Do I continue taking these after an iui, or after ovulation? Also if I get pregnant from iui do I continue taking them? So I seen this at target today, thought about getting it. But I do take a prenatal vitamin and 40mg of magnesium. Are those all safe to take with this or should I stop the prenatal? Can you take this with clomid? 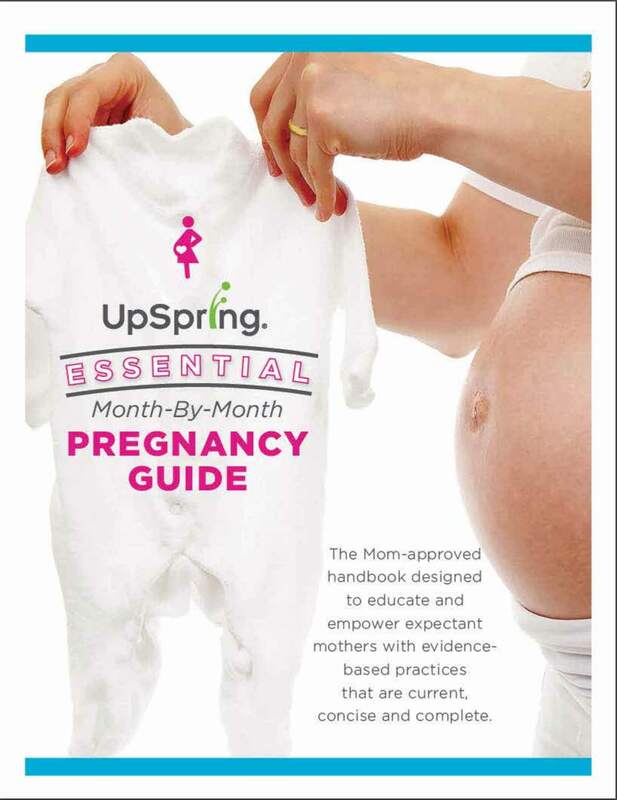 Hi @ElizabethRogers, The UpSpring Fertility+ is meant to be taken with a prenatal. If you take a magnesium supplement, that’s OK too. In fact, magnesium is what we have in our Morning SickLESS kit that helps with nausea and the root cause of morning sickness. Always check with your doctor if you have any questions or concerns, but if you’re trying to conceive, we highly recommend you use our UpSpring Fertility+ to optimize your body’s hormones and cycle and the Prenatal+ to ensure you are getting the right nutrients to support a growing baby. Sending you lots of love and baby vibes! Can you take this with Ovasitol? Hi @Kayla in response to ["Can you take this with clomid?"] Our Fertility+ was designed to help optimize women’s bodies naturally using three powerful conception herbs (maca powder, shatavari and black cohosh). We cannot give medical advice, and recommend that you consult your doctor first. Sending you lots of love on your trying to conceive journey! I’ve being trying to get pregnant now for over 8 years.. I have PCOS.. my boyfriend often comes in me but no signs of being pregnant. I started talking these a week ago... I hope to be pregnant soon.. Do you think these would work for me after trying to get pregnant for so long? Hi Khalee! Great question. PCOS can be a tough nut to crack. While supplements cannot treat or cure any disease, they can contribute to optimum conditions for healing. 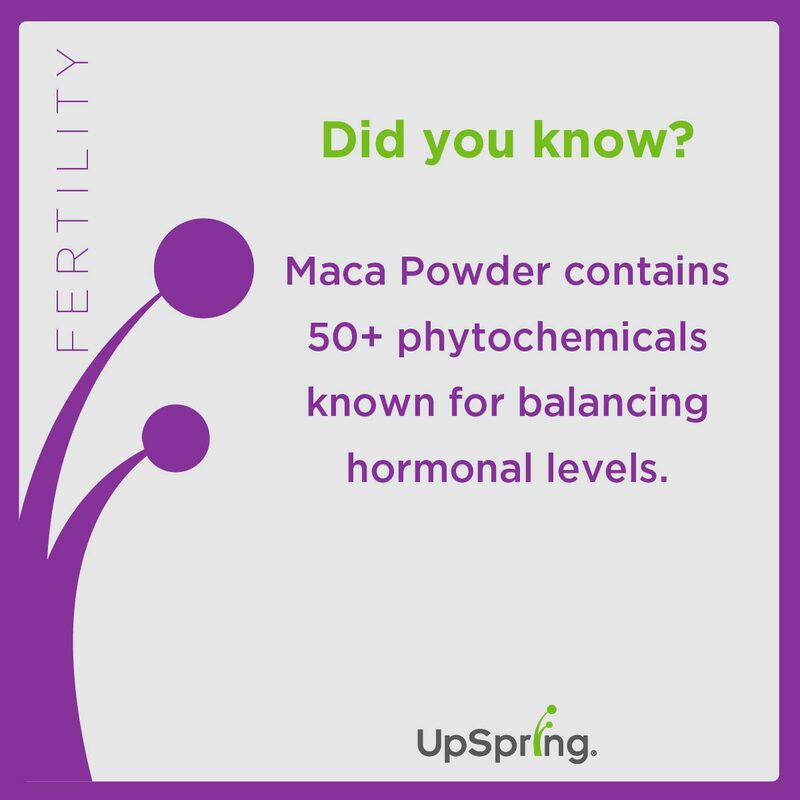 Clinical studies show that the key ingredients in UpSpring’s Fertility+ supplement – maca root, shatavari, and black cohosh – are indeed supportive for women with PCOS. Maca contains naturally occurring phytochemicals that help support healthy progesterone levels. Shatavari helps to support healthy insulin levels, which in turn affects the balance of other key hormones. Black cohosh supports the body’s production of two fertility-related hormones, follicle-stimulating hormone and luteinizing hormone. When taken together these can help support healthy hormonal balance. Everyone is different. While we can’t predict the particular outcome for any particular woman, we are confident that this formula helps your body create the best possible conditions for becoming pregnant. Hope this helps! Hi! I have never been diagnosed with PCOS, however my periods are not regular in any way which is making it hard for me to get pregnant with my 2nd child. Can I this just to help regulate my periods/ovulation even though I don't think i have PCOS? I had been taking these for a month and ran out so I stopped for a few days to get new bottle . My period is never late but it didn't show up for 37 days. I was not pregnant. Now I've started my period. Is is normal for this to happen if you stop taking the upspring fertility pills and restart . Will the upspring pills help you ovulate if you do not ovulate on your own? Can i take two pills a day to get pregnant faster.? The recommended dosage is one pill per day. It’s important to remember that on average you have a 15-20% chance of pregnancy each month, so you may need to take Fertility+ for more than one month. We recommend taking the product for a minimum of 3 months in order to give the herbs a chance to fully kick in. While we can’t predict the outcome for any particular woman, we are confident that this formula helps your body create the best possible conditions for becoming pregnant.